Make reservations now to join us for a special Valentine’s Day Dinner Menu on Thursday, February 14, from 5:30 p.m. to 9:30 p.m. The romantic five-course meal costs $79.95 per person (plus tax and gratuity) and offers a choice of each of premium hors d’oeuvres, piping-hot soup, fresh salad, gourmet entrée, and decadent dessert. The meal also includes a complimentary rose for every lady and live entertainment throughout the evening. Call now to reserve your spot at 404-634-6268. *Our regular dinner menu will not be served on Valentine’s Day. Our next Dinner and a Diva, the first of the 2019 Season, is on Tuesday, January 15th and features Opera’s Greatest Hits. Under the musical direction of Capitol City’s Opera's Catherine Giel, members of the Capitol City Opera Company's cast will musically transport you to the opera hall for an evening you do not want to miss! This month's program will feature 'opera hits' from La traviata, Martha, Carmen, La bohème, Turandot, Lakmé, Pearl Fishers, Barber of Seville, Gianni Schicchi, and Rigoletto. Cast members for the evening will be soprano Elizabeth Claxton-Castillo, mezzo soprano Heather Witt, tenor Jose Caballero, and baritone Stephen McCool. The dinner includes a sampling of premium hors d’ oeuvres, fresh salad, choice of two gourmet entrees, decadent dessert, hot coffee/tea, and two glasses of fine wine, for only $65 per person (tax included; gratuity separate). The performers from the Capitol City Opera Company sing between each course. The evening begins at 6:15 p.m. with a cash bar and hors d’oeuvres reception; dinner and performance start promptly at 7 p.m. Reservations are required. Please call 404-634-6268. To allow our staff some much-deserved time off for the holiday, we will be closed all day (for lunch and dinner) on Tuesday, January 1, New Year's Day. We apologize for any inconvenience and appreciate your understanding. To allow our staff some much-deserved time off for the holiday, we’ll be CLOSED ALL DAY on Monday, December 24th (Christmas Eve) and Tuesday, December 25th (Christmas), as well as for lunch on Wednesday, December 26th. We will reopen for dinner on Wednesday, December 26th. So enjoy the holidays with your friends and family and then visit us afterwards. Don’t forget, we will be open on New Year’s Eve for a special six-course holiday menu. Space released for Boar's Head Feast! Don't miss tonight's Dinner and a Diva with the Madrigal Singers performing Boar's Head Feast! Join us for a seasonal sensation of cheery carols, merry music, and a four-course gourmet meal. After a sold-out show Tuesday night, we have released limited space for Thursday, December 20, and Friday, December 21. Reserve your seat now for this holiday treat featuring a 15th century costumed, a cappella vocal ensemble specializing in secular and sacred music spanning the centuries. Cost is just $65 per person (tax included; tip extra). Reserve your seat at 404-634-6268. Don't delay; these shows sell out fast! Join us on Monday night, December 31, for a very special six-course New Year’s Eve dinner, complete with a champagne toast. Enjoy your choice of each of premium hors d'oeuvres, savory soup, fresh salad, gourmet entrees, and decadent dessert (broken up by an intermezzo course of raspberry sorbet tickled with champagne to cleanse the palate). See the complete menu here. This gourmet celebratory meal costs just $89.95 per person (plus tax and gratuity). The New Year’s Eve dinner features a sampling of some of our finest dishes and desserts. The hors d’oeuvres choices include Crêpe de Crabe, Shrimp Cocktail Trio (three sauces), Lamb Lollipop or Fresh baked Tomato and Mozzarella Tarte. Soups selections are creamy Lobster Bisque or thick Potato Puree topped with aged cheddar cheese and chives. Salad selections include classic Salade Cesar and customer-favorite Salad Petite Auberge featuring mixed greens, hearts of palm and mushrooms. The entrée list boasts several gourmet options: Fruits de Mer “Petite Auberge” (broiled lobster tail, fresh diver scallops and jumbo shrimp), Loup de Mer Provençale (seared Chilean sea bass), Beef Wellington (grilled beef filet wrapped in puff pastry), Cotes d’Agneau (rack of lamb) or Magret de Canard (pan seared duck breast). All entrees are served with a potato, rice and/or vegetable. To conclude the meal, we have these decadent desserts complemented by a champagne toast: Tarte aux pommes (French apple tart), award-winning Chocolate Caramel Bread Pudding with rum butter sauce, Strawberries a la Romanoff or Grand Marnier Crème Brulée. Our regular menu will not be served on New Year’s Eve. 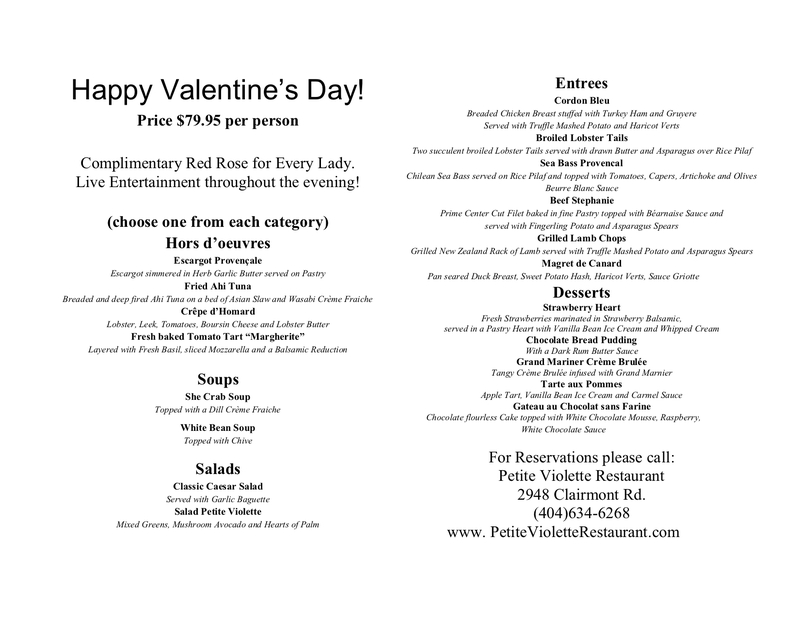 Reservations for the special menu are strongly suggested at 404-634-6268. Bring a loved one or a whole group of revelers and ring in 2019 with us!